If you’re trying to sell your motorcycle, following these steps will easily raise the price up to 10%, if done right. It’s the process I followed to sell this beautiful Ninja 650 here. Keep in mind that the process detailed below is what I do for comprehensive motorcycle detailing, not regular washing. I do this once or twice a year at most, or for special occasions. For regular washing I use the same bike cleaning products and processes, just not all of them and not as meticulous. Your motorcycle detailing is done! Some people don’t care about what motorcycle cleaning products they use – but for others it’s down-right dogmatic. I’m somewhere in the middle. I like quality products for vehicle detailing, but I’m not going to pay more for some bike shampoo or carnauba wax then I’d pay for a tank bag. Here are the motorbike cleaning products I’ve come to prefer over the years. I can personally attest to them being both cheap and good enough to make a difference. Of course, unless you’re doing a full detailing, you won’t need all of them. For most routine cleaning just a minority of them will suffice. Though all of them have their use when it comes to how to clean a motorcycle. Keep in mind that most of these are concentrated cleaning products. That is, you only add a cap-full or two to a bottle or bucket, making a 16oz bottle equivalent to gallons of product once diluted. They’re cheaper, take up less space and last a lot longer. Note – I really like Chemical Guys or Mother’s products, as you’ll tell from the abundance of their options. I have no relationship to them whatsoever. These really are the products I personally use on my cars and bikes, or around the home. Like Apple or Android fans, you tend to end up picking favorites and sticking with ’em. Bug & Tar Remover/Delicate Degreaser – I use Bug & Tar Heavy-Duty Car Wash Shampoo whenever I want to deep-clean the bike. It foams ok and works well in a spray bottle. It’s about as strong as I’d feel comfortable using for motorcycle detailing. Heavy-Duty Wheel Degreaser – Most normal bodywork soaps aren’t strong enough to remove brake dust. Or any of the other chain lube and grime that ends up adhering to wheels and rims. I use Diablo Gel, which I love thanks to how it stays on the dirt like a gel, doing wonders to soften it. As opposed to dripping off like others. How to clean a motorcycle wheel becomes a lot more laborious without a strong degreaser like this. Plus, you use it diluted. The awesome smell it has is just the cherry on top. Motorcycle Shampoo – I’ve been using Glossworkz Paintwork Cleanser for years as the finishing touch prior to polishing, sealing or waxing. It’s just a good soap without wax. Bike Shampoo with Wax – Some parts of the bike simply can’t be hand-waxed. I’m pretty partial to this Wash & Wax Shampoo for quick monthly motorcycle washes. It foams great and beads water off the bike almost as good as a hand wax. If you only had to pick one soap, it would be this one. Glass Cleaner – This is another product I use as much around the house as I do on the bike. One bottle makes a gallon or two of cleaner, depending on strength. Besides that, it’s a decent general-purpose surface cleaner that smells fine, is suitable for tinted windows and doesn’t streak. What more can I ask? Paintwork Clay – Among motorcycle cleaning products, this is a detailer’s best kept secret. It makes a huge difference when needed. Effectively it “shaves” junk off paint without damaging it. I use Mothers Gold Clay Bar System to remove embedded debris. Once the included lubricant runs out, Clay Luber is a good value. Paint Polish – Claying does wonders to smooth the rough surface of paint. But to remove the paint swirls from previous rubbing, wiping and drying you’re going to have to polish. Mothers California Gold Pure Polish is easy to find and works well for the price. Micro-Polishing Glaze – This fills in any minor imperfections and provides the foundation for posterior sealants and waxes. Metal Polish – This stuff is an awesome cleaner and polisher for any bare metal or chrome. Regardless of it being a fender or household silverware. You can give metal a mirror-like shine with it. It’s definitely one of the motorcycle cleaning products whose use is most blatantly noticeable. Of course, the polish is perfect for exhausts, too. You might have seen the bottle of Chemical Guy’s M-Sealer Wax in the Genesis Coupe rear spoiler DIY I did a while back. Paint Sealant – A sealant is to wax what full-synthetic oil is to mineral engine oil. It’s the modern-day, man-made equivalent to compensate for all of wax’s shortcomings. The main problem with normal wax is longevity. 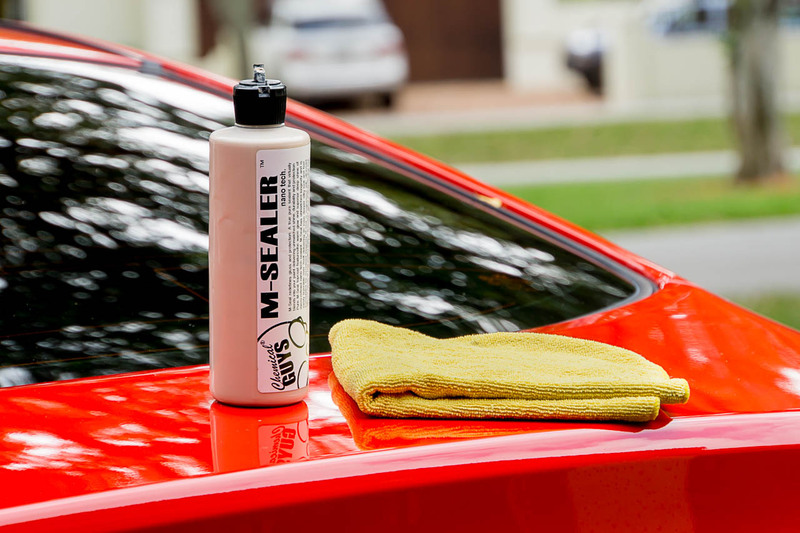 Where most waxes last about a month, a good sealant will protect your paint for up to a year. I use Chemical Guy M-Seal Micro Finish Factory Paint Sealant. One advantage is that a little goes a long way. Carnauba Wax – Though it may not be as durable, carnauba waxes (allegedly) produce a deeper shine than sealants. Whether you believe that or not is irrelevant. What is a fact is that two layers of wax are always worth the effort. That’s why I layer Mothers California Gold Carnauba Wax over the sealant to get the best of both worlds. Oil-Based Plastic Protector – Second only to waxed glossy paint, nothing looks as nice as deep-black plastics. The product I’ve been using lately is this Bare Bones Undercarriage Spray. You can use it to carefully touch up your tire’s sidewalls for special occasions, too. Water-Based Plastic Protector – Yet more cleaning products for your motorcycle. An oil-based product is great for rugged plastics, but for any plastics you come in contact with, water-based is better. I absolutely love this stuff for vinyl and other plastics. For motorcycle detailing I literally douse my bike with it. Plus I use it around the house daily for plastic cleaning and protection. Chemical Guys Silk Shine Dressing is probably responsible for why I started liking their products so much to begin with. Before thinking I’m exaggerating, give it a try and prove me wrong. If you have matte paint or any other delicate or exotic finish, you really shouldn’t be using regular shampoos and waxes. Most of the time it will lead to spots or other hard to remove aesthetic artifacts. For matte paintwork and vinyl wraps, I’d stick to a delicate matte auto wash shampoo rather than the options above. 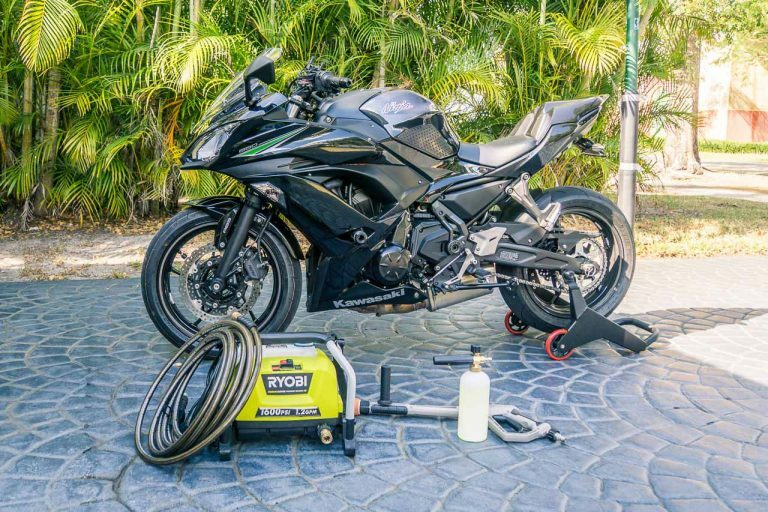 To best take care of motorcycle detailing, you’ll need a few things. 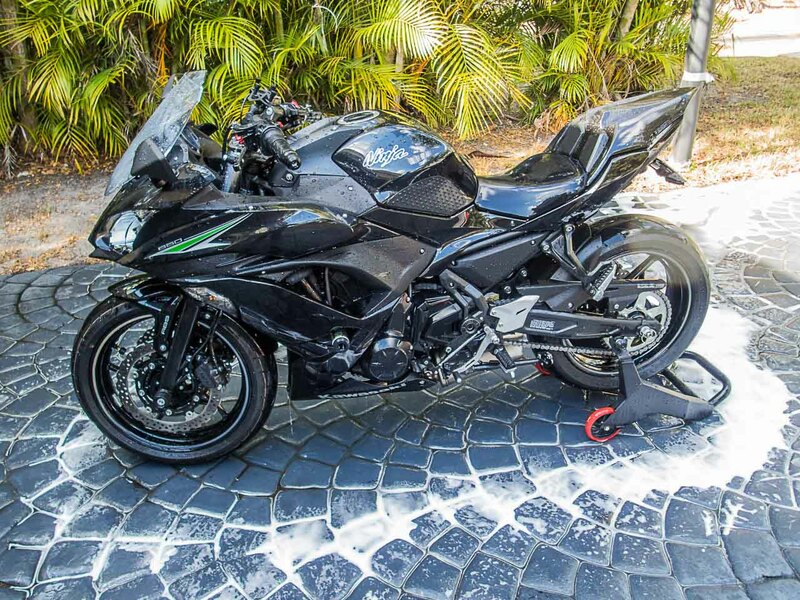 I’ll be going over how to clean a motorcycle on this 2017 Kawasaki Ninja 650. Electric Pressure Washer – I’m a huge advocate of pressure washers, so I always use one for vehicle cleaning. 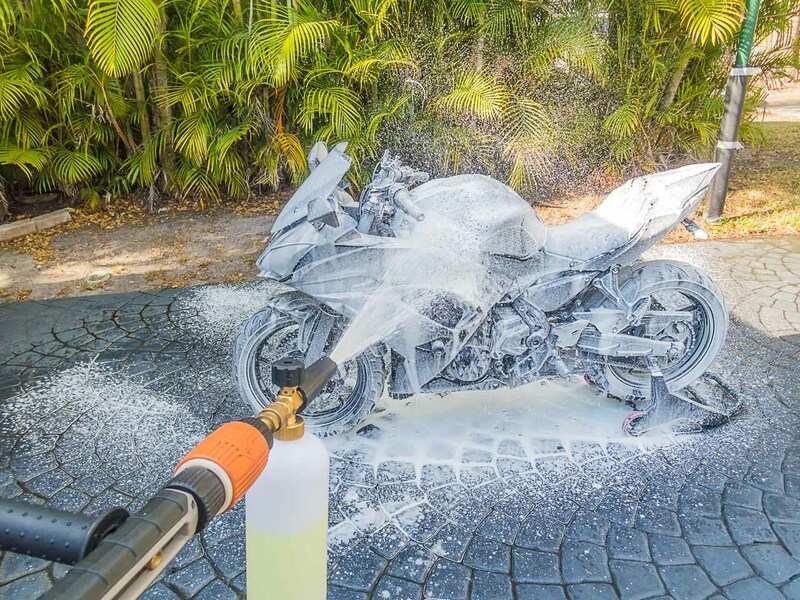 Foam Cannon – Part of why I love power washers for motorcycle detailing and cleaning is because it allows me to use a foam-gun. It’s much more effective. Buckets – You wouldn’t expect to see how to clean a motorcycle without buckets, would you? The only thing worth mentioning is to use a grit guard. Most paint swirls come from dirt embedded in the sponge or towels. That helps avoid the swirls. The reviews speak for themselves. Mitts – Or you can use sponges instead. A Pair of these mitts is what I use. It’s cheap and it works great for cleaning stubborn grime without scratching. Microfiber Towels – If you don’t dry off the water drops with some towels, a detailed motorcycle is never going to look as nice. Regardless of what cleaning products you use on your bike. Rear Stand – Whenever I do my motorcycle detailing, I use a race stand to keep the bike upright and stable. It just makes life easier. Exhaust Plug – The last thing you want when you shampoo and wash your bike is to fill the exposed muffler with water. And you wouldn’t be the first to do it, either. Whenever you wash or rinse the bike, plug the exhaust. It’s cheap insurance. Wheel Brush – Tires are grimey and full of black soot. You’re going to need something to clean them exclusively. Otherwise you’ll just inevitably smear the tire’s gunk on to the rest of the bike. A tire brush is pretty much essential if you want to reuse your mitts or sponges again, regrettably. The first step in how to clean a motorcycle is an easy one. Just soak the motorcycle with low-pressure water and let the crud soften for a few minutes. If it’s sunny, keep wetting it to make sure it doesn’t dry. Once all the bird droppings and mud has had a chance to soften, move along. Oh, and don’t forget to plug the muffler with an exhaust plug or at least an old rag! The last thing you want on start-up is for your slip-on to do its best impression of Old Faithful. Prior to bothering with shampoos, first you’ll want to remove all the dirt and crud that water pressure can easily remove. That will expose the underlying filth to the soap in the next steps. For this nothing beats an electric pressure washer. I’d recommend electric since they are weaker than gasoline-powered units. However, it requires special care nonetheless. Motorcycles are water-resistant, not waterproof – Be it a garden hose or a pressure washer, if you use it wrong you can damage the electronics. Just give the bike a quick spray to remove as much as water alone can. A quick note. Whenever you spray water on a bike, don’t point it directly at electrical connections. It’s okay if the jet-stream is strongish, but for reference, it shouldn’t be so strong that it would hurt your hand if you pointed at it (don’t do that). I use a pressure regulator to reduce the water pressure and a 6-in-1 quick connect nozzle to select a soft, fanned out stream. Either is compatible with the vast majority of pressure washers out there. This foam cannon gun does a great job applying the shampoo thick. Plus it keeps the soap clinging on for a deep soak. The next step of motorcycle detailing is to wipe the slate clean. We want to strip off any wax, bug guts, road crud, tar, etc etc. You get the idea. I’m using Chemical Guys Bug & Tar Heavy Duty Car Wash Shampoo. Whichever motorcycle shampoo you use, just make sure it strips (removes) wax. Some do, some don’t. In a pinch, you can use dishwashing soap – but only for this step. To apply the soap I use a pressure washer and a foam cannon. That saves a not-insubstantial amount of time and effort. Plus, seeing the bike all white is always freakin’ awesome. If you only have a garden hose available you can use this garden hose foam gun instead. Once the bike is covered in foam, give it a quick once-over with a sponge or mitt, frequently rinsing it in a bucket full of clean water. Here’s where the grit guard comes in handy to prevent swirls. Lastly, concentrate on the rims with a wheel brush you’ve reserved for that use. The black soot from the brake dust makes using the brush unusable for anything else. Likewise, a chain brush on the motorcycle’s chain will help get any superficial rust off. Claying a vehicle is a professional car washer’s secret. It’s what makes paint feel super smooth and silky to the touch. Furthermore, a motorcycle has little body work, and you’re in direct contact with it often. 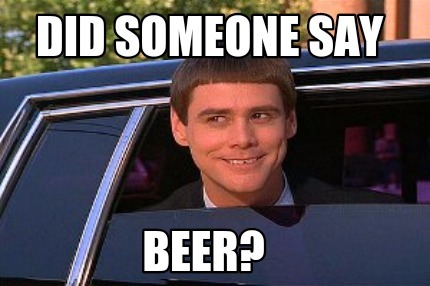 It’s a no brainer to spend the 15 minutes it takes to do so. It removes debris that can’t be removed any other way, and without any damage or swirls at all! I use Mothers Gold Clay Bar System. To test if you would benefit, put your hand in a plastic shopping bag and slide it hand over the paint. If the surface feels like it has grit embedded in the paint, you should clay it. One thing it’s great at removing is spray paint over-spray. In a way, it “shaves” them off the paint. Claying a motorcycle is easy. Just spray the paintwork with the included lubricant and rub the bike with the clay like it’s an eraser. Just make sure to not drop the clay on the floor. We’ll want to remove all the residue from the clay, as well as remove any debris that we’ve loosened in the process. Or any crud that’s been softened since the first wash. Basically we just shampoo and wash the bike again. For this step I use Wash & Wax, which has a wax emulsification. The benefit is that it protects all the inaccessible nooks and crannies – think all the exposed wires, brackets and hoses around the engine. Thanks to the wax, not as much gunk sticks to them, and it also protects the surfaces from the sun’s UV damage to certain degree. In particular, focus the shampoo around the engine, behind the bodywork, or anywhere else you aren’t willing or capable of waxing by hand. A clean bike with dirty wheels is a dirty bike with a careless owner. Cleaning your rims by hand is an important step in how to clean a motorcycle. And given the caked-on residue from the brake pads and chain lube splatter, it does take effort. To help with all that I use a wheel cleaning gel that clings on to the rim. I just spray it, let it soak while a grab a cold one, and come wipe all the junk off a few minutes later. The rear wheel is easy enough to clean and shampoo thanks to the rear stand. But for the front wheel, one tip is to use a wheel cleaning stand. With it you’ll be able to access and clean the whole circumference of the rim. This will take out the superficial scratches in the clear coat, and will give it a much nicer shine after waxing. I use Mothers California Gold Pure Polish. Application is just like you’d imagine. Apply a bit to a microfiber towel, and rub in a random pattern until you’re satisfied. After the polish, soap up the bike with some non-wax auto shampoo for the last time. You want to remove any residual motorcycle cleaning products, degreaser or left over dirt. Dry the motorcycle well to avoid water spots. Before moving to the paintwork improvement side of how to clean a motorcycle, we should rinse it one last time. Another interesting component of quality motorcycle detailing is glaze. Though the polish will remove superficial scratches, there will still be scratches too deep to polish out. A paintwork glaze will help fill in those gaps, hiding them and leading to a much more uniform shine. You apply it like you’d apply polish, you just don’t have to put as much effort into it. If you have any metal and chrome that has started to show superficial rust, polish it before it gets too bad to fix. Both as a cleaner and as a polish, few products have impressed me as much as this Heavy Metal Polish. And looking at the reviews, I must not be the only one. Either for restoring old metal, removing rust or polishing otherwise dull metal, this stuff is surprisingly effective. Like mentioned previously, sealants are a long-lasting synthetic version of wax. It’s a worthwhile addition for your motorcycle cleaning routine. I really like Chemical Guys M-Seal Micro Finish Factory Paint Sealant. If nothing else because it’s affordable and a little goes a long way. That bottle should last you more than a year. Apply it to all the bodywork, pieces of glass, the dash, light housings, etc. If you’re motivated, apply two coats. It will protect it all from the sun’s UV rays. Pretty much anything but the matte, rough black plastics that are typically used for under-body type areas. It applies just like regular waxes – Rub a bit in, let it dry to a haze, then buff out. When it comes to waxing a motorcycle, the indisputable king in the field is Carnauba. It’s a heat-resistant, scratch-resistant natural wax that comes from a type of palm tree. It provides an arguably nicer shine then sealants, but doesn’t last as long. I use Mothers Gold Carnauba Liquid Wax. If you’ve got the time, apply two coats. This makes the paint look even better, and ensures you don’t miss any spots. Keep in mind that it’s always good to layer carnauba wax on top of a paint sealant, but it isn’t good practice to apply a sealant on top of natural wax. Just keep the sealant under the wax. One of the things that have the greatest effect on appearance is shiny, deep-black plastics. You can’t say you know how to clean a motorcycle without achieving that. On the other hand, dull plastics with a whitish residue tanks the aesthetics of any vehicle. And if you’re selling your motorcycle, that means lowering the resale value. I’ve tried a lot of products for this, and my current favorite is Chemical Guys Bare Bones Undercarriage Spray. The stuff goes a long way – I’ve been using the same 16oz bottle for almost 2 years now. Besides the rich, oil-based shine it gives, it helps remove the white residue that wax leaves on plastics. Seriously, always avoid getting wax on matte black plastic. Apply to all unpainted black plastics, and if you’re willing to do so carefully, to the tire sidewalls. Generally it’s not recommended (with good reason), but it looks so nice that for a special occasion it could be worth it – like taking pictures of the bike. Just don’t get any on the tread. Some areas are too complicated to take care of, but matter enough to try protecting. Like the handlebar controls area. My favoritest motorcycle detailing product of all is this one: Chemical Guys Silk Shine Sprayable Dressing. It cleans and protects just about everything and gives it that new-looking sheen. If you sell used stuff on Ebay, it will pay for itself. I use it around the house almost daily. The real advantage is that it doesn’t look unsightly if you don’t wipe off the drops. 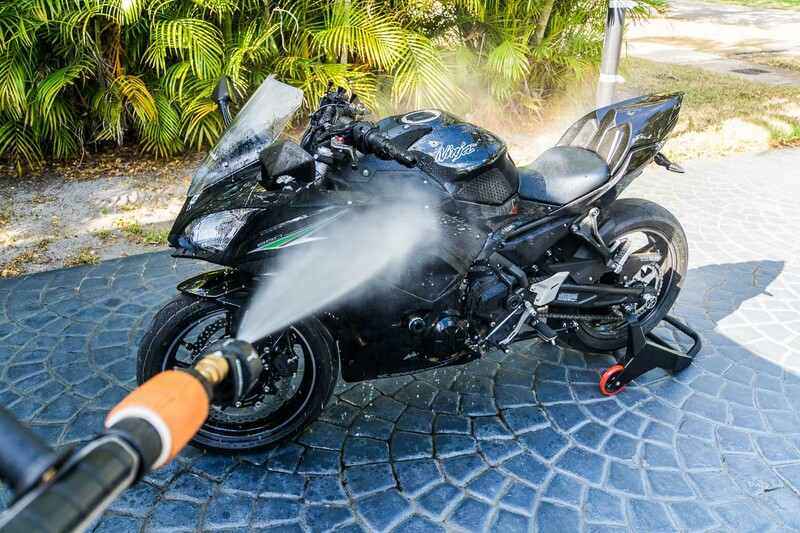 Unlike other motorcycle cleaning products, if you spray it and let it be, it will still look nice and shiny once it evaporates. Though it’s an unconventional motorcycle cleaning product, it certainly makes a difference in how to clean a bike. And I still haven’t found a surface it’s damaged, or something that didn’t look better after applying it. I even use it for engine bay detailing in cars. Basically spray it on everything you haven’t treated so far, and then rub it in where possible. Specially plastics around the engine or in the inaccessible areas. Under the seat, as well as the controls are also good candidates. Don’t spray it on the seat if you don’t want to make it a tad slippery. Personally I do so and have no issues with it, but some people find it annoying. Clean and protect glass or plastics. Some over-spray or wax gobs will have unavoidably reached the mirrors and light housings. After the final wash, I’d use the water-based plastic protectors from before for the plastic light housings (on top of the sealant), and a glass cleaner for the mirrors. 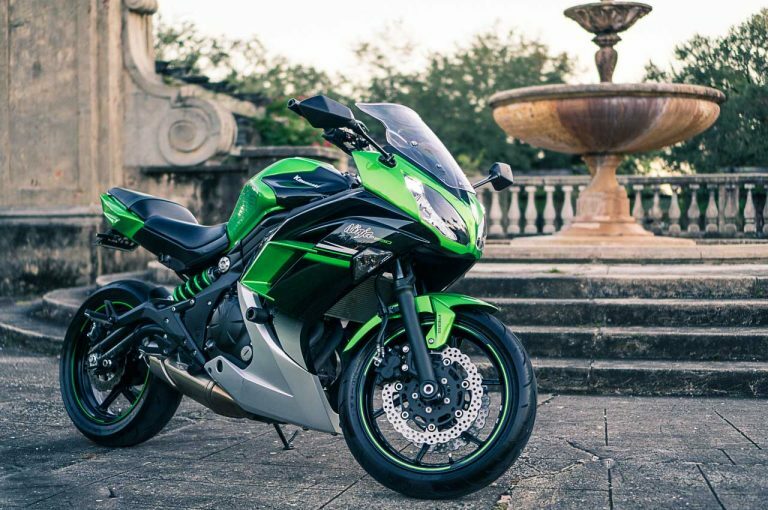 Any time the bike’s chain gets soaking wet – like during motorcycle detailing – you should lube it to avoid damage. Even though this is about how to clean a motorcycle, maintenance plays a part. Now that most of the motorcycle detailing is done, it would be a good time to take care of the chain. Any time you soak the chain, including rain and a motorcycle wash, you should lube it to avoid damage or any rust forming. Regrettably, motorcycle cleaning products won’t do for this job. For some tips and tricks on chain maintenance, as well as the process I use for taking care of it, check out my detailed how-to on chain lubrication. The final step of how to clean a motorcycle is to give the bike a final wipe-off. Buffing out any water drops makes a huge difference aesthetically. Specially making sure no oil-based plastic protector, wax or other motorcycle cleaning products got left anywhere they shouldn’t be. A picture is worth a thousand words, they say. In that case, here’s a few pictures of a couple of bikes after following this motorcycle detailing process. As you can see, the results of the wash speak for themselves. These cleaning products have certainly helped make a difference on these bikes. And you’ve seen that it isn’t all that hard to clean a motorcycle this way. Well, you’ve finished! If you store your bike outdoors, put a cover on it. To be honest, even though I keep mine inside I tend to cover it anyway. Doing so helps keep the bike dust-free and protected from minor bumps and impacts in a household garage. 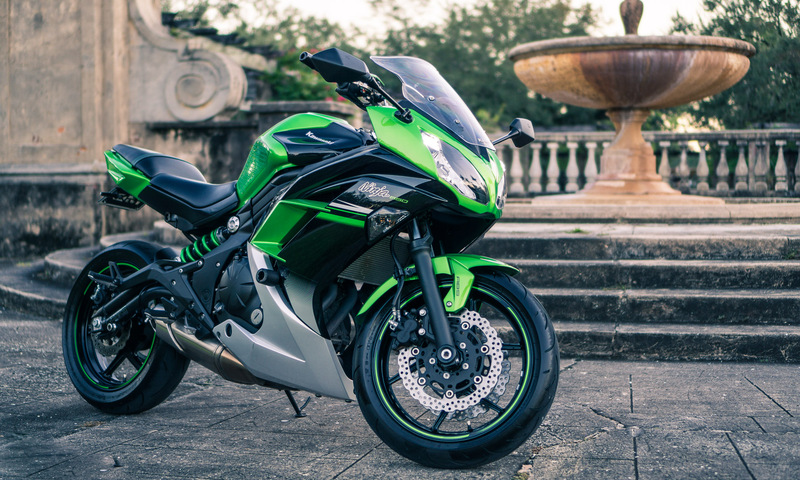 Hopefully you’ve learned a thing or two about motorcycle detailing. 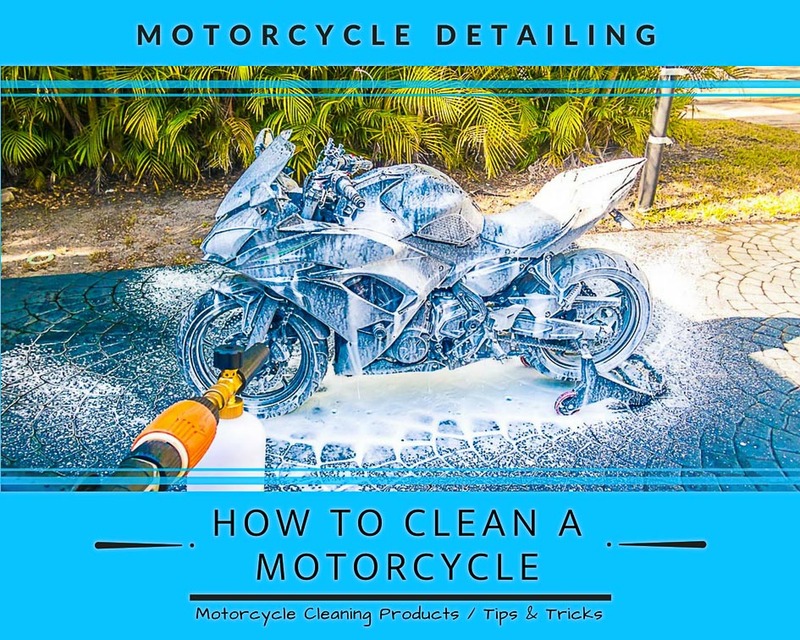 Now you know best how to clean a motorcycle next time, as well as what motorcycle cleaning products to use. Keep this up on a routine basis and the bike will stay gorgeous for years! Something that will definitely come in handy when the time comes to sell your motorcycle. Cleaning every crevice of your bike will help avoid the rust and corrosion. It will also protect your bike from tarnish that you wouldn’t even know is taking place. Baby wipes can also be used to clean helmet visor if you are on the road. They are easy to carry and works well as a short term cleaning solution. One question I have is when you spray the bike with soap. I’ve always been told to avoid the electronics areas but in your picture, it looks as if you have doused the whole bike in soap. Have you had any issues in doing so with your electronics?? Hey there! Which electronics do you mean? The dash, or the the connectors on the side? In any case, obviously it isn’t ideal to spray those areas, but as long as the connectors are in good condition there shouldn’t be any issues. Bikes are suitable for riding in the rain, after all. On new bikes that are well kept, I wouldn’t feel bad lightly spraying them. On older bikes whose seals might be deteriorated, protecting them with some aluminium foil wrapped around is a good idea. Regardless, the takeaway is the if done carefully, you should be fine. If something were to happen, it would be because of a pre-existing issue with the waterproofing the connectors should have.